And I just updated the picture tutorial to make giant roses from cardstock, with better vine leaves template. It’s so easy, so simple yet beautiful. Why not DIY wedding or party decor? Step 1. Grab your A4 printer paper or cardstock (from 120 to 180gsm). Step 2. 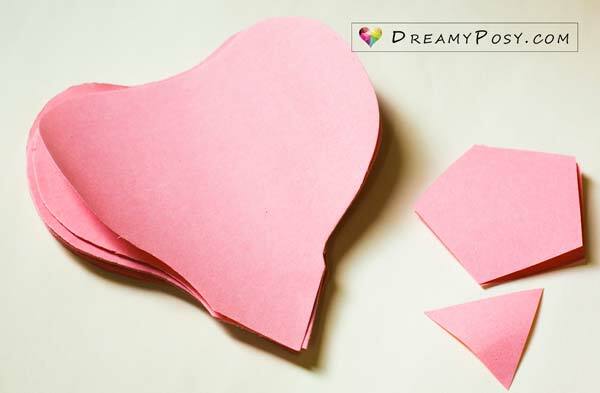 Cut the petals from the template. You could use your Cricut to cut from SVG template or manually cut the PDF template by your scissors. For the printer paper version, I cut 18 petals, 1 triangle, and 2 pentagons. For the cardstock version, I cut 23 petals, 1 triangle, and 3 pentagons. Color the petal if you want. In the video, I use watercolor for the orange flower and pastel chalk for the pink one, and I love the texture effect of watercolor more. If you use watercolor, consider drawing water first as it will help to blend your color easier. Step 3. Glue 3 petals with the triangle for the first layer. 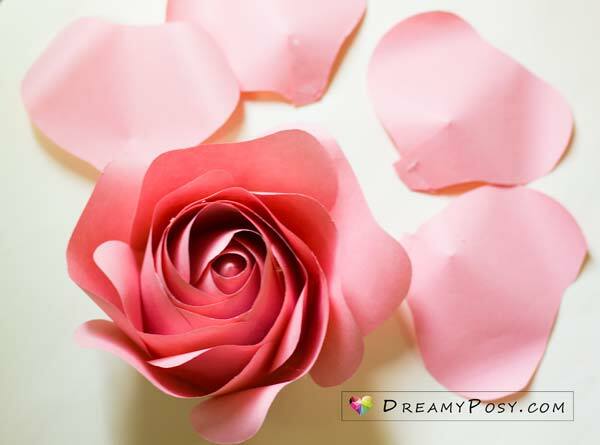 Use a stick to curve the petal and form these 3 petals for the center of the giant rose. Step 4. 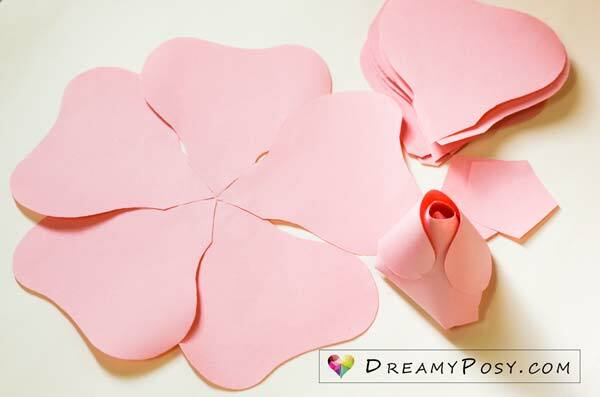 For the 2 outer petal layers, glue 5 petals with the pentagon and use a stick to make the petal’s curves. Then glue each petal to the center accordingly. Step 5. 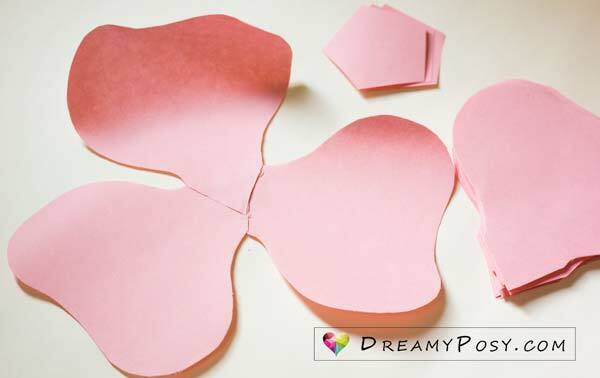 For the outer layer, cut and shape the petals and glue it to the flower. Step 6. For the last layer, cut a line to divine the bottom of each petal. Then glue it to form a curved petal before gluing to the flower. Step 7. Insert a string to the bottom of the bottom of the flower before covering by a large circle. This string will help you to hang the giant rose to where you want. 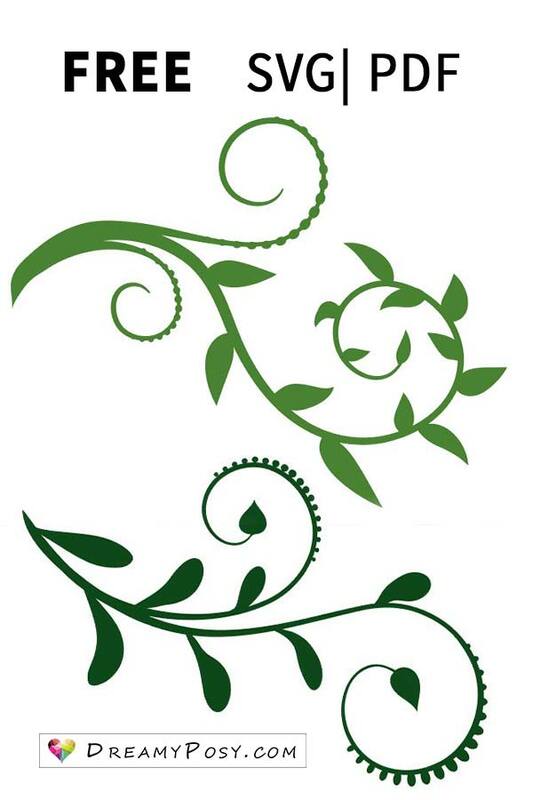 You will find the paper leaves template in PDF and SVG format here. 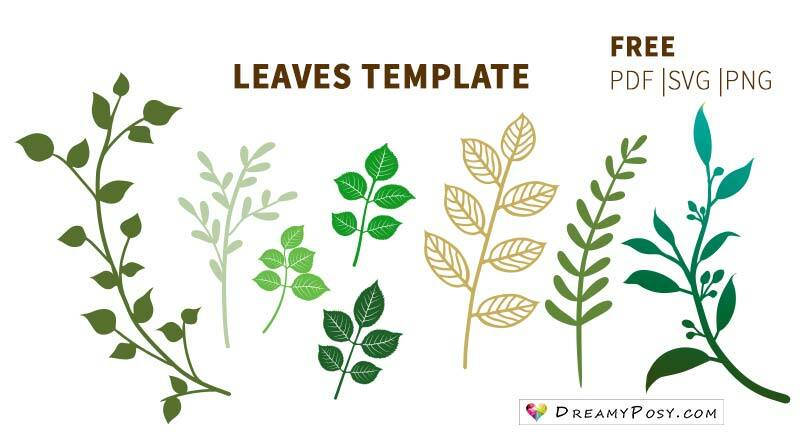 You could find many more leaves template here. Want more free template for giant flower? Check this out. 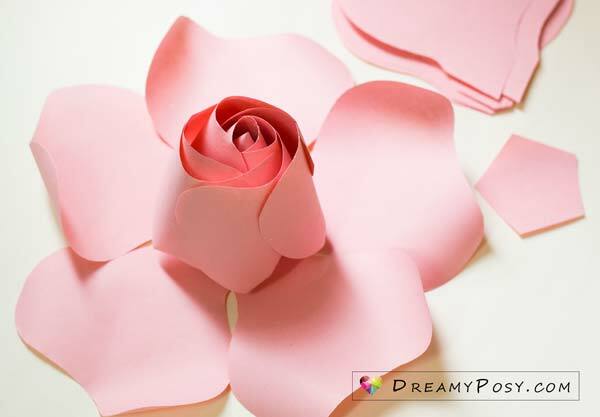 Tutorial to make giant rose from printer paper. 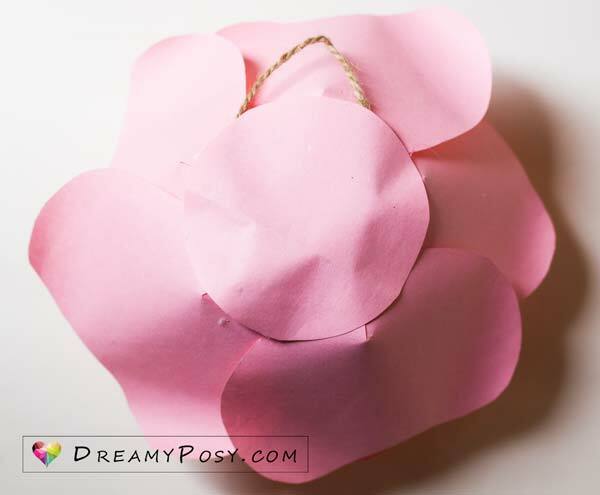 Tutorial to make giant rose from cardstock. Like arranging a centerpiece or a bouquet, the backdrop will be fancier if there have big, medium and small flowers, foliages and fillers, with color harmony. It will be boring if we arrange the same size flowers together, like this, lol. DreamyPosy.com’s GIANT ROSE TEMPLATE (PDF file, SVG file) and LEAVES TEMPLATE (PDF file, SVG file1, SVG file2) (Please do not share my templates directly. Please refer to my post to get it all free). The best beautiful I ever have seen. Thanks !!! Thanks Kristina. I’m glad you like it. 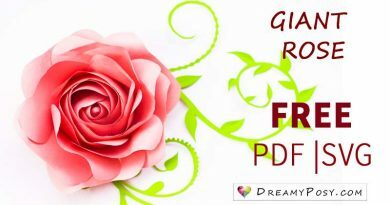 Thank you for the beautiful videos and for the wonderful free templates! You are blessed with an amazing talent for creating such beautiful flowers and other exquisite creations I’ve seen on your website. I must admit I was a bit lost in the beginning, but I went back over the previous comments and that helped me to navigate your website a bit better. Thank you so much, Rogena. Congras on your daughter’s wedding. How sweet mom you are. Your daughter is lucky, Heather. What happened to the templates for the large leaf and the vine, that were with the original giant water colored paper rose made with printer paper? I just had them a couple days ago and can’t find them today! Please, help! Hi Tavia, I did not changed any links recently. I suggest that you could search for it from the leaves post. The large leaf for the rose does indeed seem to be missing. The rose itself is just amazing! I’ve just checked and the large leaf is in the page 2 of the rose template PDF file, dear. Thank you. Pls go to my youtube video, https://www.youtube.com/watch?v=-7LQoPRENbI&t=13s, turn off the music, and play at the lower speed (0.25x). Or you can play and pause at each step. I’m affraid that people will be boring at my normal speed hehe. Your website is lovely but it takes forever to find the link to the templates. Sometimes your material list is at the top, sometimes it’s at the bottom of the page, sometimes the link to the template is there, sometimes it’s somewhere else in the post. This is very confusing and makes it hard to find the link. Also the templates are great but some are not labeled properly (eg flower template plain – which flower is this?). The template also needs a small box giving basic instructions just in case the person cannot find the matching instructions on the website. Also all the videos make it hard to navigate on the website and slows everything down. Please don’t think Im being mean – I am just offering constructive criticism. I love your website and think your flowers are amazing. Thank you so much for your suggestion. I will think about this and will need your further advise. Wow! So delicate and pretty flowers. Thanks for share your art. We really appreciate all your effort and talents. I need this for my niece wedding decoration. Thanks you so much for helping this so the handcrafter auntie. I’m glad you like it. Congrast, Marae. Amazing tutorial. thank you so much! If I wanted to cut this on my cricut, what size/proportion of the petals and middle piece should I cute to make the large rose. Will this work with construction paper? Thank you so much!! 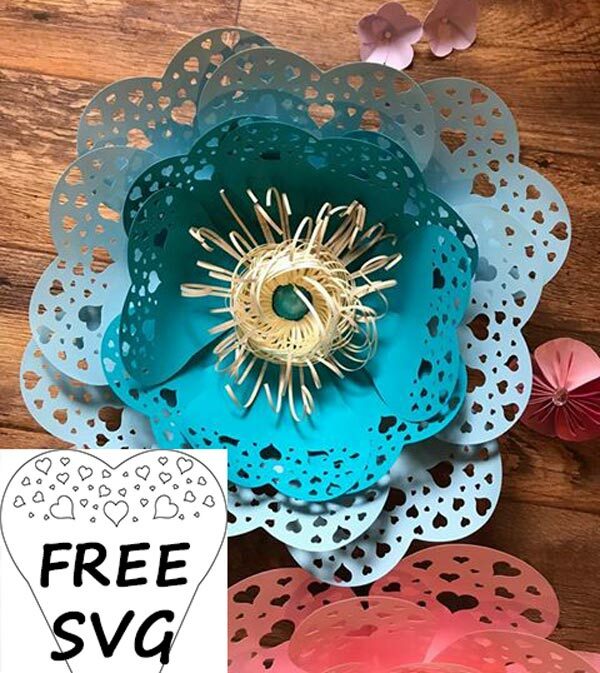 Out of all the vague, half posted, hard to follow tutorials out there that say free and aren’t, I didn’t think I would be able to make the flowers for my little girls birthday party. Thanks to you and this amazing free template and easy to understand guide she was blown away at her very merry birthday mad tea party!! Love this! Thanks again! Hi, you have suggested to haveu various sizes of roses for a backdrop. How do I make a medium or even a small rose with your current template? *could you email me pls? Thank you! THANK YOU for the template. Gorgeous and JUST what I was looking for. Gracias, pls baje hasta el final de la publicación y encuentre la frase “Dreamyposy.com’s template”. Simplemente haga clic en template de palabra rosa. Thank you so much for showing how to do these! I am having a baby shower and I was thrilled to find this site your flowers are beautiful! You are welcome. Thank you for leaving me a comment, Priska. 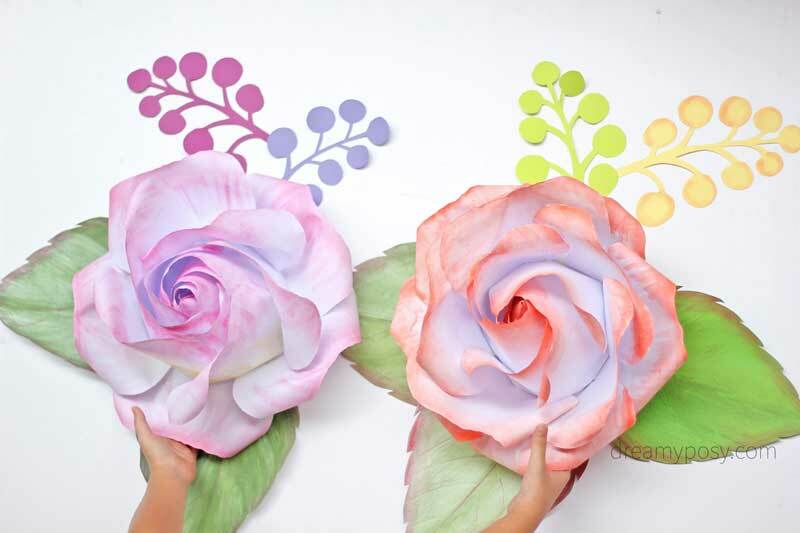 I am trying to make large paper roses for my grand daughter’s 1st birthday party and these are beautiful. I can not seem to get the download to work on my computer. Can you send me the download of the template to my email, please. Dear Sheila, if you scroll down a little bit in these comment section, you will find that template link is a little pink link in the end of the material list. BTW, I have sent it to your email. Kindly check. Thank you for your interesting in my site. Wonderful, can I know how to get the free template? Please kindly find the template link in the end of the material list. Thank you so much. I would also like to get the template. When I click on the link, it doesn’t go anywhere. Thanks. Hi Linda, you might found that I replied Nixxie already. The template link is a little pink link in the end of the material list. Please let me know if you still can not get it. Thanks. Wow you totally slayed it! ! !.the flowers look lovely and quite real.thanks for sharing your knowledge. OMG! This site is so awesome, your flowers are so perfectly beautiful! 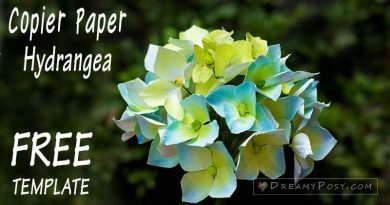 Finally discover a site that I will always go to whenever I need a free template and tutorials when I need to make paper flowers for my family parties. Thank you so BIG for the freebies and very helpful tutorials! Thank you so much for leaving me a nice comment, Christine. I’m glad you love it. Please help to share with your friends. How to print them ? You will find a template link in the end of material list, click it to download the PDF file and print it out. Thanks Nourhan. Your flowers are so beautiful and I love that they’re made from simple materials. I have been searching for info on how to make a flexible stem for an extra large rose (or any other large flower). Any ideas that don’t include chicken wire? the template is printing with your watermark. How do I print without the watermark? Thank you for passing by, Teresa. People used to cut the template on a cardstock and save it for next time. Then you use the cardstock as the pattern on your printer paper. Can I just say your flowers are really Beautiful and thank you so much for sharing you insperation with us. Many many thanks. I just discovered your awesome creations on YouTube. 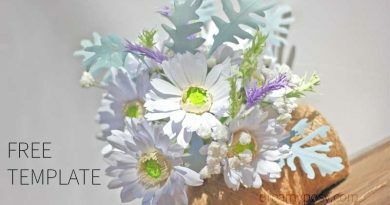 Your flowers are lovely and your tutorials make them looks very do-able. I’m going to give them a try for my mom’s 95th birthday party. Before I rush out to buy my printer paper, can you tell me what size to buy….8.5″X11″ or something larger? Oh hello Marilyn, I’m so thrilled to hear your mom’s 95th birthday party. Wish her all the best. Thank you so much. If I can make them near as lovely as your’s are, I’ll send photos. 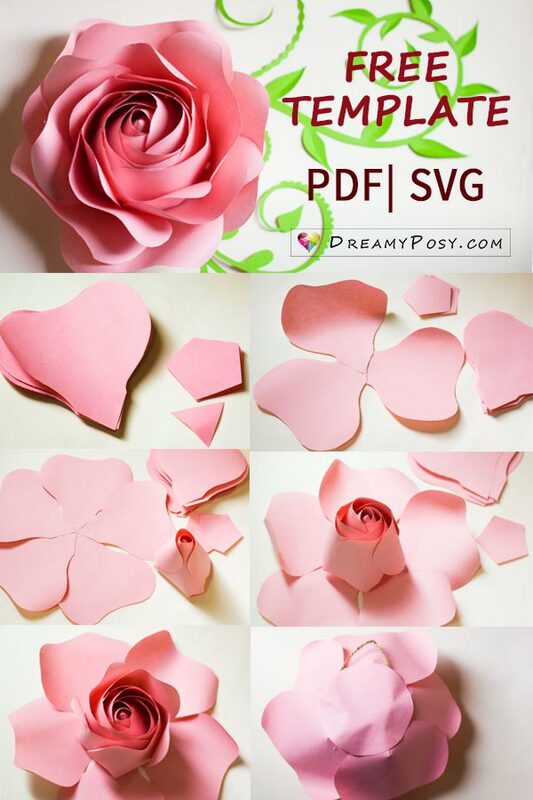 ShareTweetPinPreviously, I made this video tutorial to make a giant rose step by step from printer paper, with FREE template.